Danes sem si vzela čas za svoj hobi - papirčkanje. Odločila sem se za izdelavo TAG - a. Ker imam precej raznih izrezov in redko uporabljenih šablon, sem se zakopala med svojo ˝robo˝. Izbrala sem rezalne šablone TH, Distresse, odtis, ki je že dolgo sameval med drugimi in druge malenkosti. Mislim, da je to do sedaj moj najlepše izdelan TAG. 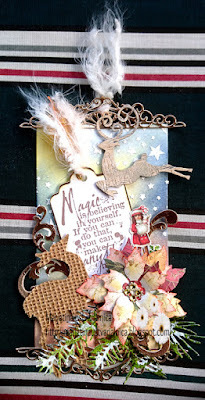 2 Crafty Criters: # 20, ATG with criters, Nov.
Beautiful tag and I love the sentiment. Amazing work. What a beautiful creation, loving all the pretty details and gorgeous flower! So nice to see you joining in this month at my Crafty Wednesday challenge where it's all about seasonal holidays/Christmas! Hope you join in again soon! What a pretty Christmas tag with so much dimension, many thanks for joining in with our 'Get ready for Christmas' theme at Stamping Sensations challange. this is a very detailed tag. love all the textures. thanks for joining us at TSOT! What a gorgeous project - so many beautiful things in one place! Thanks so much for playing at TSOT! Beautiful tag, Marjeta. Kisses, my friend. Lovely creation, well done! Thanks for joining us at The Sketchy Challenges.